Discussion in 'Chatroom Discussion' started by emeraldellie, Sep 24, 2010. Please keep in mind that not everyone who is reported will be banned. When you report to an op, the op will decide if the person being reported deserves to be banned. Please keep in mind that ops cannot see your PM conversations unless you send logs to us. If you wish to report something someone did in PM, you must send us the entire conversation between the two of you, because we can't see it otherwise. If somebody calls you a scammer/hacker/poopyhead/moron or something else only midly offensive in PM just once, then it does not need to be reported, and you should just use the ignore command. If somebody is relentlessly insulting you and/or using vulgar language, report to an active op (instructions below), and then use the ignore command (explained below). When somebody is banned from the channel, they can still PM you, UNLESS you use the ignore command. It is very important to ignore someone after you report them. If somebody is spamming advertisements in PM, clan recruits, or anything else not allowed in the main channel, report it to an active op and then use the ignore command. All chat reports are done by PMing an active op. First, choose an op to report to. Ops with the words "away", "afk", "sleep", "school", etc in their names are not active, so don't report to them. Tell them the name of the offender and give them evidence (explained below). If the op you've chosen doesn't respond after 5 minutes or so, try another one. If you are reporting a scammer, and none of the ops are responding, see instructions further down on how to use Serebii Forums to report a scam. Ops cannot see what goes on in your PMs with other people, so all reports for PM offenders need to be backed up with evidence. Ops accept two kinds of evidence: screenshots of conversations, and copy/pasted chat logs. Screenshots are more reliable than chat logs and are more likely to get the person banned. Chat logs are not as reliable and are less likely to get the person banned. Make sure you have the chat window open with the person you want to report. Press the Print Screen button (on most keyboards it's in the upper-right part of your keyboard and may be abbreviated as "Prt Scr"). 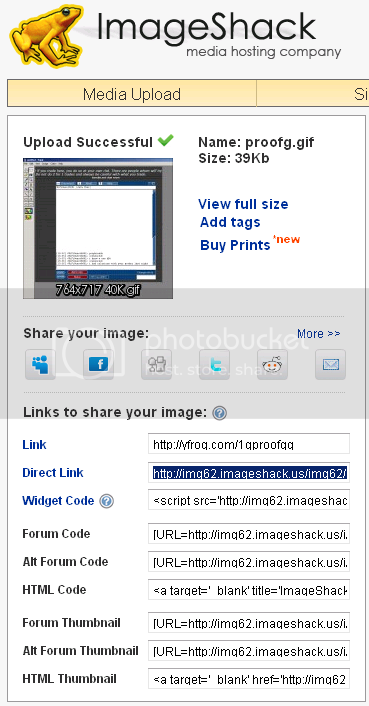 This will automatically copy a picture of your chat window onto your clipboard, but it will not tell you. Open up Paint, or any image editing program. Click the Edit menu, and click Paste. 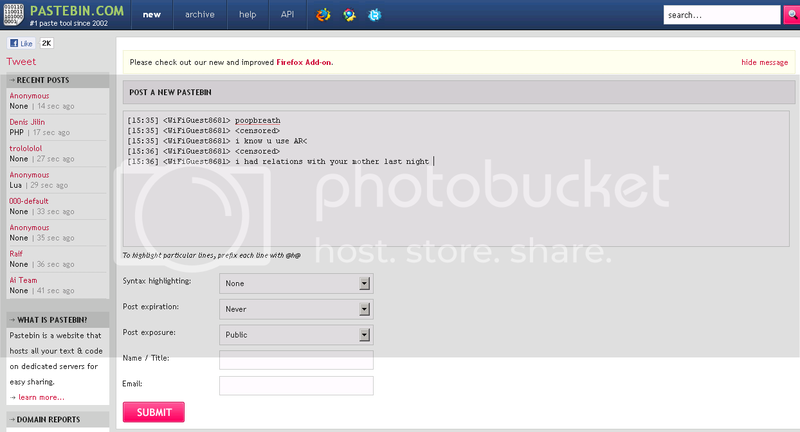 Watch as a picture of your chat window is put onto your canvas! 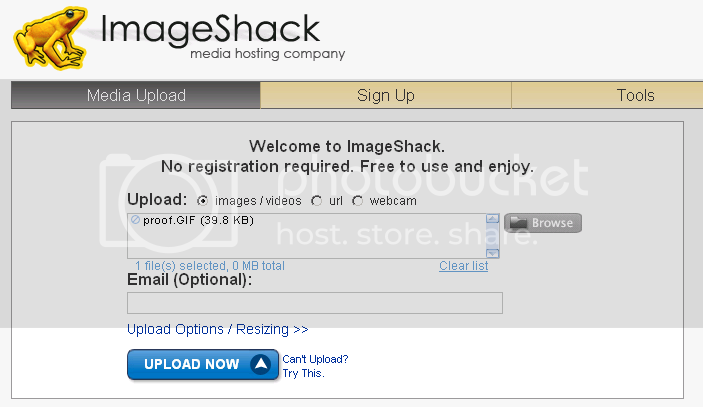 Go to http://www.imageshack.us/ and click Browse. Find your saved picture, and click Open. Click Upload, and wait for a new page to load. Press Command-Shift-3. An image of your current screen will be saved to your desktop. Highlight the entire conversation that you want to copy. Wait for a small window to pop up that contains all the text you highlighted. When it pops up, highlight everything in the new window, and Copy it. 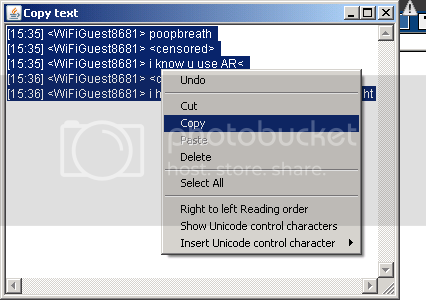 Go to http://pastebin.com , and on the first page you see there will be a text-editing area. Paste your chat logs into it. Then click Submit. Make sure you have your evidence handy before you report. Telling an op you have no logs/screenshots because "i closed the window" is not acceptable, and your report will be dismissed until you can provide proof. Ignoring the person will make sure that they don't PM you anymore. Ignoring will start to work as soon as you close your window with them. When you're reporting someone, make sure you do it before you ignore them, so you don't accidentally close the window before you can get your proof. If you are reporting this person, make sure you've already collected your evidence and reported before proceeding. Open your PM window with them. Type /ignore their name. Ignoring is CASE SENSITIVE, so be ABSOLUTELY SURE you've typed their name properly! Notice how it says /ignore WiFiGuest8681 and not /ignore wifiguest8681. Make sure all capital and lower-case letters match the person's name.